The Aero Med Express® Diamond Jet is a fixed-wing air ambulance that has been carefully outfitted to meet the needs of a multitude of medical situations. It comes equipped with a Lifeport patient handling system, a complete climate control system to insure a comfortable transport for the patient, and the most advanced communication, weather radar, and navigation systems that are available today. This aircraft cruises at 500 m.p.h., ensuring minimal time away from the health care facility. Aero Med Express® is fully outfitted with modern, well maintained medical equipment, such as oxygen and suction capabilities, cardiac monitor and defibrillator, ventilator, I.V. infusion pumps and fully stocked emergency medications. Additional equipment is added as needed on a case-by-case basis. Air ambulance services provide people with an efficient, safe way to quickly get their loved ones to a distant hospital or medical facility. 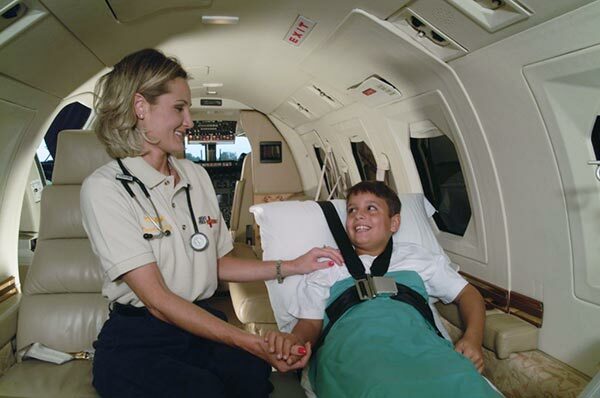 At Aero Med Express®, our aircraft is staffed with experienced medical professionals who are capable of dealing with a wide variety of injuries and emergencies so you know when you use our air ambulance service that you or your loved ones are in capable hands. Our air ambulance service provides you with an aircraft that is complete with all the equipment necessary for emergency situations and all the technology needed to get to the right medical facility in the shortest amount of time possible. Choose wisely when you search for a reliable air ambulance service. Choose Aero Med Express®!